The task of finding a user or group name in Active Directory using wildcard, regular expression or pattern is not as evident as it seems. The matter is that by default the standard ADUC (AD Users and Computers) console doesn’t allow use of wildcards in the beginning or in the middle of a search phrase. For example, you need to find AD groups that contain the word “password” in their names. The common search by the key “password” hasn’t shown any results. The search by using “*password*” is also unsuccessful (wildcards just don’t work). You can perform search operations in graphical ADUC console with the help of simple LDAP queries. To do it, open Find menu, and select Custom Search in the dropdown list. Type name=*pass* in the Enter LDAP query field. Note. It means you want to find all users and groups that contain pass in their names. To do this, use the wildcard character * on both sides. As you can see, 39 AD objects have been found. Tip. We also recommend that you read the article about using saved LDAP queries. Also, to search for AD objects, you can use a PowerShell module for Active Directory. 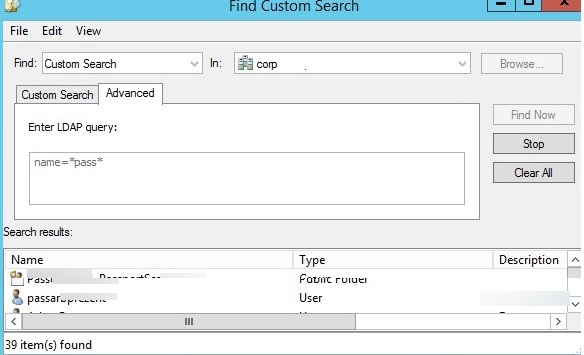 In contrast to the method described above, using PowerShell to find something in AD requires a separate cmdlet to search by groups, users or computers (Get-ADGroup, Get-ADUser or Get-ADComputer cmdlets respectively). 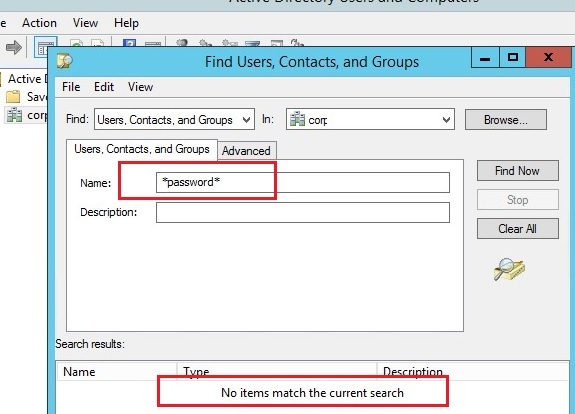 I hope these simple ways will make it easier for you to find objects in Active Directory.